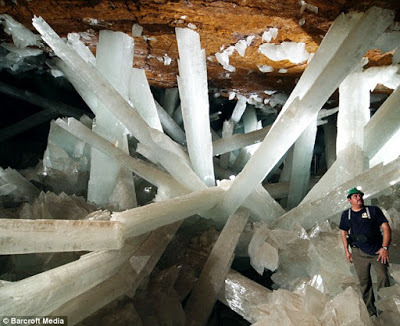 Gypsum is a naturally occurring mineral which is often used in industrial processes and which in nature, if left alone for thousands of years, can grow into huge translucent, towering and eerie, crystals more than 10 metres tall. These are famed for their beauty in places such as the Cave of Crystals in Mexico. Nevertheless, the formation of gypsum has until now been largely unexplored. A study by researchers from the School of Earth and Environment at the University of Leeds and the Laboratorio de Estudios Cristalográficos CSIC-University of Granada found that gypsum starts off as tiny crystals of a mineral called bassanite. Most of us know this as Plaster of Paris as we use it in building, art-work, casts and fireproofing. Currently bassanite plaster is manufactured at a rate of 100 million tons per year by dehydrating quarried gypsum at 150 deg C. Builders, artists and medical specialists buy the bassanite powder and add water to create a malleable material that hardens once dried again. By experimenting with supersaturated gypsum solutions, the researchers were able to produce bassanite at room temperature. This than transforms to gypsum. Professor Liane G Benning from the University of Leeds said: "This process has never been documented before. In nature gypsum grows as these fantastic large crystals, yet we show that in the lab gypsum actually grows through the assembly of many, tiny bassanite crystals. These link together like a string of pearls before they crystallize to gypsum. We studied hundreds of high-resolution images and caught the tiny bassanite crystals in the act of assembling into gypsum"
Their findings are published April 5 in the journal Science. The lead author, Alexander van Driessche from the Laboratorio de Estudios Cristalográficos in Grenada said: "Our study shows a new, low cost and low temperature way of making bassanite, although so far we have only managed to keep it stable for up to one hour. " This finding may also be applicable for reducing the clogging of pipes and filters through the precipitation of gypsum during water desalination or oil production. It can cost millions of pounds to remove gypsum from a pipe -- a serious economic problem specifically for countries supplying much needed drinking water. Prof. Juan Manuel Garcia Ruiz, the director of the Laboratorio de Estudios Cristalográficos in Granada said: "The study reveals how a natural mineral forming process can have important economic consequences for our daily lives. It also tells us how nature can make such beautiful and enormous crystals as seen in the caves at Naica or even the gypsum and bassanite, recently documented on Mars." Finally, Prof. Benning said" If we manage to produce and stabilize bassanite crystals at room temperature through a clean, green method for long periods, we don't just learn something about a natural process but, compared to what is industry standard currently, our research could also lead to a massive cost and energy saving for the production of plaster." The above post is reprinted from materials provided by University of Leeds.